It’s the week before Christmas and I’ve got a million things to do. One of them is to plan some things for me and the boy to do on Friday. We have a whole day to ourselves before the madness begins, and he’s already requested crafts and baking. Those I can do. I’ve been wanting to try to make some paper baubles for a few weeks, I finally had the chance this morning. These paper baubles are so simple to do, but they look pretty smart and I’m sure they cutting and sticking will appeal to my son. Paper bauble making will definitely be on our agenda for Friday. You’ll need coloured paper, I used plain red paper and a patterned red paper which I thought would work well together. On your coloured paper, draw around the rim of the glass to make a circle. You’ll need at least 8 circles to make your bauble. Cut your circles out and fold them in half. If you’re using patterned paper, the pattern needs to be in the inside of the fold. Using the glue stick, glue the folded halves together; if you’re using plain and patterned paper, alternate them. Make sure your circles are well stuck together, you might want to press them under a heavy book for half an hour to make sure they’re firmly glued together. I found it best to make two halves of the bauble before putting the ribbon on. To fix the ribbon in place, give the inside half of one side of your bauble a really good rub with the glue stick. Lay your ribbon in place and having given the other half of the bauble a good rub with the glue stick, press the two sides together. Your bauble is complete and ready for hanging up on the tree. Now the weather has taken a decidedly wintery turn I’m starting to get into the Christmas spirit. This weekend was an especially cold one, the small boy had a nasty cold and we decided to stay in, cosy in front of the fire and have a lazy weekend. Keen to get cracking with some Christmas crafts we busied ourselves by making a reindeer crown using hand prints and we were pleased with the results. The reindeer crown kits are available from Baker Ross and come in packs of 4 or 16. The packs contain everything you need to make the crown, except for glue, though we used double sided sticky tape because it’s quicker and there’s less mess than with glue. The instructions are really easy to follow. Draw around your hands and cut out your hand print shape – I did the cutting because the small boy is terrifying with scissors or anything with a blade. The instructions suggest you use glue to stick the cut our hand shapes onto the headband, but I used double sided sticky tape for this. The other pieces, the ears, the reindeer hair and the holly and berries are self-adhesive, so the small boy peeled the backing paper off these and stuck them onto the headband. Once he had finished he very proudly wore it around the house for a few hours, I think these make a nice alternative to the paper cracker crowns we are forced to wear for Christmas dinner, so I might make myself one to wear on Christmas Day. There was some parental supervision required with the cutting out of the hand shapes, but other than that he did the rest himself. It was something he enjoyed doing, he likes peeling and sticking things. It was pretty simple, but it kept him interested and entertained for a while. Another good and fun Christmas activity from Baker Ross! It may still only be November but I’m already starting to feel a bit Christmassy, I think it’s probably down to all the planning ahead of time so I’m less stressed later. They must be talking about it at school too as the small boy is all excited and ready to get stuck into the festivities. We’ve been busy baking Christmas cakes and starting to think about presents and decorations. One wet afternoon we sat and made some snowman mosaic coasters which I’ve decided would also look great as Christmas decorations. The snowman mosaic coaster kit from Baker Ross contains everything you’ll need – a pre-cut snowman with a selection of foam stickers to stick on and decorate your snowman. If like me you want to turn the finished snowman into a Christmas tree decoration you’ll need a bit of ribbon and some sticky tape too. Popping the foam stickers out of their sheet and peeling the backing off them is quite fiddly for little fingers, so it’s good practice for the small boy who has recently turned five. He did very well and managed to do most of them himself, only asking me to help him with the white circles, probably because there were lots and lots of them. This is a great task to help with hand-eye co-ordination and to improve dexterity and finger strength, which can really help with learning to write. It’s a really simple kit and the snowman mosaics look really effective, too good to just be used as coasters, which is why I’m going to attach some ribbon so we can hang them on the tree once that’s up. The snowman mosaics kits are from Baker Ross and come in packs of 6 or 18. It’s a nice tidy activity to do, it doesn’t require any setting up or any mess, just have a bowl ready to put the bits of backing paper in and you’re sorted. In fact I’ve put one in my bag for when we go out, it’s something we can do together while we’re having lunch that doesn’t involve an ipad. The thing I liked most about making the snowman mosaics was the chance to chat. We were both industriously beavering away on our snowmen, chatting away about school, Christmas and his recent birthday, and occasionally bursting into happy song. It was a fun half hour on an otherwise grim November day. I don’t know about you, but I almost weep at the cost of Christmas cards. I’m sure that and the cost of postage are one of the reasons why fewer people seem to be sending cards. In a attempt to cut some costs, and impressed by the handmade cards we were sent last year, I was determined to try my hand and make your own Christmas cards. Back in September I visited the Brookside Garden Centre near Poynton in Cheshire, while I was there I popped into their craft shop. The shops stocks lots of docrafts products, knowing I already had some bits and pieces at home I just bought the few extra things I needed to make the cards. It’s a lovely craft shop and worth visiting if you’re in the area. The above items cost £13.95 in total for 25 Christmas cards, although there is plenty of paper and other bits and pieces left to make more cards than that. These cards cost approximately 56p each to make, plus my time. My plan was fairly simple, use the Folk Christmas paper, cut it into squares, stick it onto the Christmas cards and decorate with the stickers, ribbons and buttons. Once I got started I realised what a difference the ribbons and buttons made, and slightly regretted not buying a bigger selection. I played about with different designs and colours and I think one or two of the cards I’ve made are pretty good really, so I’ll be using the better ones as templates for the rest of my pack. I really love the look of the Folk Christmas range, it’s full of hand drawn traditional style Christmas illustrations and sentiments in contemporary colours. The 32 pack of papers features 16 different designs to use for card making. docrafts card making supplies are available from a large range of retailers and specialist craft shops. Homemade cards are always nice to receive because you know people have put their time and love into making them. For more information about docrafts and to find your nearest stockist visit their website. Note: We were sent the Folk Christmas Papers and Stickers free of charge for review purposes. I purchased the other items myself and all images and opinions are our own. One of the best things about Christmas is it gives me an excuse to get my craft box out and create wonky rustic homemade items for our home. A few years ago I made cross stitch cards for everyone, I often think about making my own cards and presents but I lack both confidence and time, so it was nice to sneak off for an afternoon at The Ministry of Craft in Manchester, to indulge my crafty side and have a little bit of pre-Christmas me time. We arrived at The Ministry of Craft in the basement of the Fred Aldous store in Manchester’s Northern Quarter. I’d never been before but it is heaven for crafters of all kinds. The Ministry of Craft is a lovely, peaceful room, fully kitted out for all of their craft classes. 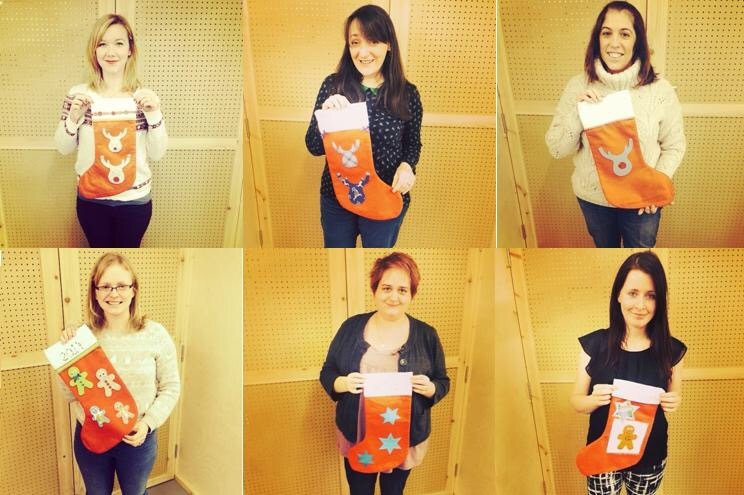 We were there to decorate Christmas stockings, drink coffee, eat cake and have a natter. Sunday afternoons don’t get much better than that. The lovely Ministry of Craft team gave us a quick run through of what we were going to do. 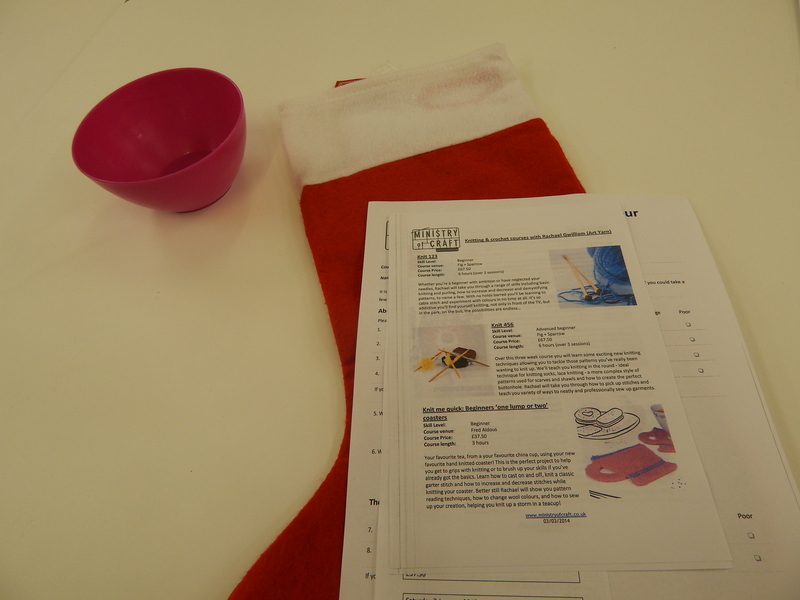 We were given basic Christmas stockings and we were going to decorate them with fabric and bondaweb, with optional hand stitching, buttons, gems and anything else we could throw at it. I opted to cut out and stick on three blue stars, the larger of the three I spent some time hand sewing some detail on with silver thread, then I used some adhesive gems to pick out the corners of the star, I was really pleased with how it looked, even if it did look a bit wonky rustic. Throughout the afternoon the Ministry of Craft team were on hand to talk us through whatever we were attempting. They were very patient and encouraging and made me really want to go back and try my hand at something else. It was a really restful afternoon in a too busy month, it was so lovely to take some time out to spend focusing on a nice task, drinking coffee and chatting. We were invited guests of the Ministry of Craft and Growing Up Milk Info and I think we all had a really lovely crafty afternoon. As a child I collected snow globes and I was fascinated by them, shaking them and watching the snow or glitter fall. I’ve always fancied making my own. I’ve seen a million craft tutorials online about how to make your own snow globes, so I thought I’d give it a go. It was remarkably simple. I’m keen to reuse and recycle our household waste as much as we can. For years all our jam jars have been washed out and used for a range of other uses, such as, storage jars, re-filling with homemade jams, chutneys and pickles and for various crafts. This time I put one of my empty jars to a more creative use. I made my own festive snow globe. Using the superglue carefully glue the figurine to the inside of the lid (make sure the lid is clean and dry), leave this for several hours, or overnight if you can. Once it’s stuck firmly to the lid you can continue making your snow globe. Tip around half a teaspoon of glitter into your empty jar, top the jar up with water and add half a teaspoon of glycerine. The glycerine helps the “snow” fall more slowly in the globe. Once you’re happy and the jar is as full as it can be, dot superglue around the inside rim of the lid and screw it on the jar tightly. Leave it to dry properly for a few hours and then shake it up and enjoy your snow globe. It really is that easy, it looks really effective too. I suspect that this is a festive craft we’ll be doing again and again.